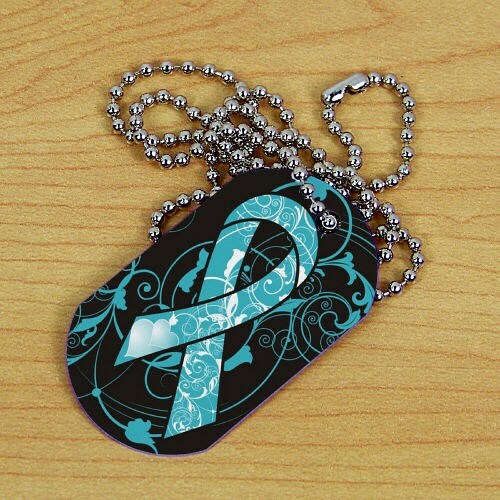 Show that you support someone who is battling a cancer, disease or condition when you wear this eye catching Teal Awareness Hope Ribbon Dog Tag. No matter who you’re supporting, everywhere you go you’ll always be helping to raise awareness. Teal is a great for spreading awareness of Ovarian Cancer, Polycystic Kidney Disease, Gynecological Cancer, Batten Disease Awareness and so much more. Our Teal Hope Ribbon Awareness Dog Tag measures 1.125” x 2” on a 30” Beaded Necklace. Each Awareness Ribbon Dog Tag is great for showing your support. Additional Info At MyWalkGear.com, we feel strongly that Awareness is the key to finding the cure for any known disease & condition. That is why we have created a collection of Personalized Ovarian Cancer Awareness Shirts and Walk Gear for your team and friends to help spread awareness. Awareness educates people about the nature of Ovarian Cancer and its implications to those who have it. Help us help others spread the awareness so that one day Ovarian Cancer will be a condition of the past.